The heritage room located at Our Lady of Good Counsel has known several homes. In the early 1970s, the first heritage display was located in a former college classroom in St. Joseph Hall. In the late 1970s, the heritage room moved to a small room next to the sisters’ community room in Theresa Hall. In the mid-1980s, the display moved to the room currently housing the Mankato campus archives office, and following a building renovation in 2002-2003, the heritage room was housed in its current location, next to the archives office. The room contains a variety of items and artifacts. 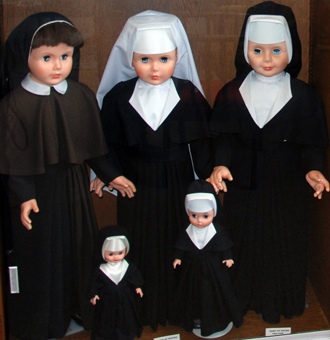 One side of a large display case houses several dolls dressed in SSND habits, which often is the first area visited, especially if a sister is giving family and friends a tour. The other half of the display case contains various items related SSND foundress Blessed Theresa Gerhardinger, Mother Caroline Friess, and Blessed Antonina Kratochwil, SSND patron of Shalom. One area of the heritage room is dedicated to artifacts from two mission areas of the former Mankato Province – Guatemala and Kenya. Other display cases hold items from most of the provinces of the international congregation. Another display case contains items from the history of the Mankato Province and its missions, including memorabilia from parish and school milestone celebrations. For many years, SSND taught at St. Joseph School in Red Wing, Minnesota, and several Red Wing pottery jars are displayed on the floor. One wall contains a large diagram of the Good Counsel Cemetery, and several aerial photos of Good Counsel Hill are located in the room as well. Two chairs of historical significance also are in the room: one that was used by Mother Caroline when she visited the mission at Hokah, Minnesota, and the other donated by Father Francis Paukert, a resident priest who lived at Good Counsel in the 1950s and 1960s. 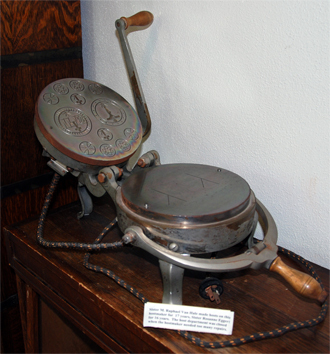 Father Paukert’s chair came from Litomysl, Minnesota, a Czech community, where SSND taught for a number of years. A second heritage room also is present at Good Counsel. This room holds memorabilia from Good Counsel Academy, 1912-1980, including uniforms, photos, scrapbooks, and large class photos. From the left: dolls wearing the dress of a candidate, habit of a novice and habit of a sister from 1963-1969. The heavy large host iron was used for making decorative hosts. Good Counsel had a Host Department that supplied several parishes with both large and small hosts for their Masses.